American Rhapsody is a “mini-piano concerto” consisting of three short connected movements, conceived to be suitable for programming on either classical or pops concert programs. American Rhapsody was co-commissioned by Rich and Stacy Ridenour, the Elgin Symphony Orchestra, the Grand Rapids Symphony, and the Kalamazoo Junior Symphony Orchestra. 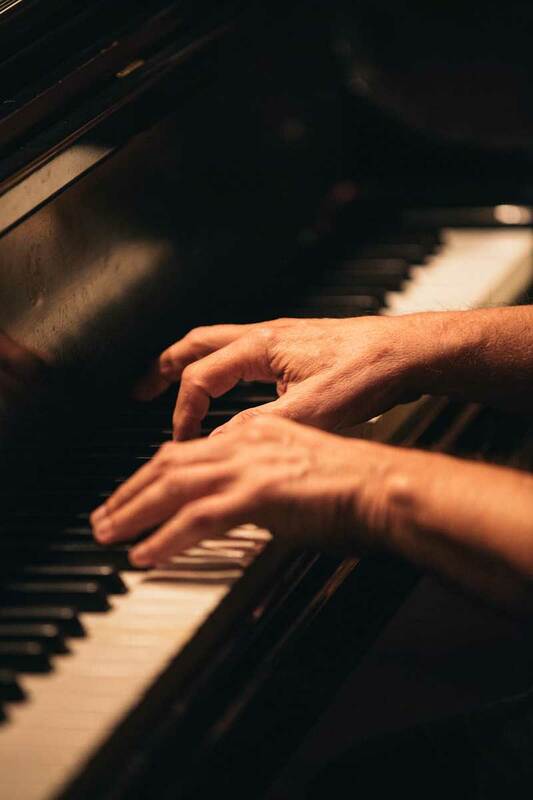 The goal of the commission was to create a work for solo piano and orchestra which could be appropriate in either a classical concert setting or a pops concert setting, in both of which pianist Rich Ridenour performs. This goal provided a challenge both stylistically and structurally, not least because most piano concertos are of substantial length, whereas the pops concert format calls for considerably shorter works. After considering various formal options, I settled on a structure that might be called a “mini-concerto”: there are three distinct movements or sections, in a traditional fast-slow-fast arrangement, but each of these three movements is short (three to four minutes), and they are connected, or played without pause. Rich Ridenour frequently performs George Gershwin’s Rhapsody in Blue, and from the beginning of the project, he suggested to me that I think about the idea of a rhapsody for this piano-and-orchestra work. There is no overt connection between American Rhapsody and Rhapsody in Blue, not least because the Gershwin work is a unique and untouchable model in its level of sheer melodic inspiration, and was composed to showcase Gershwin’s own astonishing virtuosity at the keyboard (which, sorry to say, I utterly lack!). If there is any general point of connection between the two works, it might be that they both attempt to incorporate stylistic elements of popular music and orchestral music, though in quite different ways. Where Gershwin’s popular music elements included “Tin Pan Alley” and 1920s jazz styles, mine might be said to include the keyboard styles of Billy Joel and Dave Grusin, particularly in the first movement. In the second movement, I sought to explore the lyrical, melodic qualities of both piano and orchestra. The third movement is characterized by music which is melodically and harmonically rather simple, but rhythmically complex, as the meter changes practically every bar. It is also “groove-driven” music, with lots of activity from the percussionists, but that “groove” is by nature quite uneven (it’s hard to tap one’s foot to this!). Throughout the work, the piano soloist and orchestra engage in dialogue; and near the end of the piece, there is a traditional cadenza, or unaccompanied solo passage, in which the pianist is called upon to rhapsodically improvise on all the work’s themes, before the orchestra rejoins the soloist, and together they provide the work’s driving conclusion. A demo recording is available upon request from Propulsive Music.